Citation: Michel Ioelovich. Peculiarity of phase transitions of cellulose nanocrystallites. 2016;9(5): 106. In this paper phase state and phase transitions of nano-scale cellulose crystallites have been studied. It was found that conditions of the phase transitions of rod-like nanocrystallites are depended on their lateral size (Lcr). Small nanocrystallites have instable phase state; as a result they have tendency to co-crystallization with forming of larger crystallites having a low specific surface. After treatment in boiling water small nanocrystallites of CIII easily recrystallize into crystallites of CI, whereas for CIII having large crystallites this phase transition cannot be implemented. It is also found that after heating in glycerol at 533 K three allomorphs, CI, CII and CIII, can be transformed into CIV, when the lateral size of nanocrystallites Lcr ≤ 4.3 nm; whereas the larger crystallites of these allomorphs cannot be converted directly into CIV. Furthermore, small nanocrystallites of CI are more soluble, and their transformation into CII occurs at lower concentrations of mercerizing agents. Cellulose has a multi-level supramolecular architecture consisting of elementary nanofibrils, their bundles called microfibrils, which form more large constituents – lamellas, bands and layers of cell wall [1-3]. Moreover, each fibril is built of rod-like nanocrystallites with lateral size of 3-15 nm and length of 50-200 nm, as well as noncrystalline (amorphous) domains. The nanocrystallites having three-dimensional order are strong and inaccessible structural elements. On the contrary, the low-ordered amorphous nanodomains having twisted and curved segments are weak and accessible places of the fibrils. Thereby, cleavage of glycosidic bonds at the hydrolysis occurs mainly in amorphous nanodomains of cellulose nanofibrils that facilitates release of the crystalline particles. The formed crystalline fragments with length of 50-200 nm have a level-off degree of polymerization from 100 to 400, which approximately corresponds to average degree of polymerization of individual nanocrystallites . Thus, cellulose is a typical nanostructured polymer that has some specific properties. The structural investigations of ordered constituents showed that nanocrystallites of natural celluloses have the allomorph type CI. Furthermore it was found that crystalline unit cell of CI can be in two distinct crystalline forms: triclinic CIα of P1 space group and monoclinic CIβ of P21-space group; where CIα form is characteristic for algae and bacterial celluloses, while more stable CIβ form is dominant in higher plants and tunicin [5,6]. Three additional crystalline allomorphs: CII, CIII and CIV, have been identified, which are attributed to structural-modified celluloses [1-3,5,6]. Samples containing CII-crystallites can be obtained by alkaline treatment of natural cellulose or by regeneration from cellulose solutions. Cellulose samples of CIII crystalline allomorph are derived from samples of CI or CII by treatment with liquid ammonia, primary amines or ethylenediamine. Samples of CIV crystalline form are prepared usually by heating of CIII-samples in hot glycerol. Various cellulose allomorphs have different shapes and parameters of crystalline unit cells [2,3,6-8]. Content of nanocrystalline domains in various cellulose samples i.e. crystallinity, is different, from zero for amorphous sample to about 80% for isolated cellulose nanocrystals . Amorphous cellulose can be produced by ball-milling of semi crystalline cellulose samples or by saponification of amorphous cellulose acetate in non-aqueous medium [9,10]. As known, various crystalline allomorphs and amorphous cellulose can change the phase state as a result of phase transitions, such as decrystallization, crystallization, recrystallization, co-crystallization, transformation of one into another allomorph, etc. However, in contrast to crystallites of synthetic polymers, crystallites of cellulose cannot melt or crystallize from melt, since theoretical melting point is significantly higher than the temperature of chemical decomposition . Thus, some phase transitions of cellulose are carried out within a solid state, when amorphous nanodomains turn into viscoelastic state under action of temperature and plasticizers, or into swollen state under action of special swelling agents. Some other phase transitions are of the sol-gel type, when nano-constituents are dissolved and then regenerated from the solution. Originality of nanostructured cellulose is that the phase transitions occur on the nano-level, because they involve nanocrystallites and nanoclusters of amorphous phase. Based on thermodynamic characteristics, it was proposed the following order of relative phase stability different crystalline allomorphs and amorphous cellulose (CA) at standard conditions : CII > CIV ≥ CI > CIII > CA. The amorphous phase state is regarded as a labile, because the nanoclusters of amorphous cellulose easily recrystallize under certain conditions with forming of nanocrystallites of CI, CII or CIV [9,10]. This conclusion is also confirmed by the results of thermodynamic and thermochemical investigations [12-15]. In the case of crystalline polymorphs of cellulose, the problem regarding the relative stability of the phase state is not completely resolved and remains open. Although many studies contend that the CII is the most stable allomorph [12-17], this statement does not explain, why the regenerated cellulose CII can be converted into CIV after heating in glycerol . It is also known that in contrast to conventional low-crystalline CIII1, high-crystalline CIII1 obtained by treatment of CI with ammonia at elevated temperatures under high pressures is more stable and does not recrystallize after boiling in water . These contradictory data can be connected with such specific feature of nanocrystallites as a small size leading to a high area of specific surface. As a result, phase state and phase transitions of nanocrystallites are described by special thermodynamics of nano-scale phases with the consideration of free surface energy of Gibbs-Thomson. The aim of this paper was to study the peculiarity of phase transitions of cellulose nanocrystallites, taking into account the effect of free surface energy on phase stability of nanocrystallites of various allomorphs. In particular, specific features of phase transformations of nanocrystallites upon thermal treatment, plasticizing, dissolution and mercerization have been the subject of investigations. Refined and bleached chemical Kraft pulp (KP) and cotton cellulose (CC) having CIβ allomorph were supplied from Buckeye Technologies, Inc. The CIβ bleached sulfite pulp (SP) was supplied from of Weyerhaeuser Co. The CIβ samples were additionally purified by extraction with organic solvents, chelating agent EDTA, boiling 2% NaOH and boiling water; then samples were rinsed with deionized water, ethanol and dried at 350 K to constant weight. Amorphization of cellulose was carried out by ball-milling of Kraft pulp with ceramic balls for 3 (AC-1) and 8 h (AC-2); then amorphized samples were washed with ethanol and dried at 350 K to constant weight. To obtain CII allomorph, the CIβ samples were mercerized with 20% NaOH at room temperature overnight; then the samples were washed with water, neutralized with 1% HCl, washed with water to neutral pH, rinsed with ethanol and dried at 350 K to constant weight. Fibers of regenerated cellulose (RC) with CII allomorph were obtained from Rayonier Inc. The fibers of RC were additionally purified by extraction with organic solvents, chelating agent EDTA and boiling water; then samples were rinsed with ethanol and dried at 350 K to constant weight. To prepare CIII, the Kraft pulp and cotton cellulose were treated with anhydrous liquid ammonia at 240 K for 3 h, washed with ethanol and dried. Samples with CIV allomorph were prepared by treatment of cellulose samples in glycerol at 533 K for 30 min; then the treated samples were washed with water, ethanol and dried at 350 K to constant weight. The main characteristics of the samples are shown in the Table 1. Table 1: Characteristics of cellulose samples. where Θo is the diffraction angle of the reflection (200). Thermal treatments: Hydrothermal treatment of cellulose samples was carried out in hermetically closed stainless steel containers at a liquid/solid ratio 5 for 30 min with the following washing, rinsing with ethanol and drying at 350 K to constant weight. Treatment of samples in glycerol was done at 533 K for 30 min; then, the samples were cooled, washed with water, ethanol and dried at 350 K to constant weight. Some samples were treated in boiling water for 1 h, washed with ethanol and dried at 350 K to constant weight. Structural changes of the treated samples were studied by WAXS method. Solubility: Solubility of cellulose samples in 82% H3PO4 and Cuproxam (Cu -13 g/L, NH4OH -150 g/L, saccharose -2 g/L) was studied at room temperature overnight using solvent/solid ratio 15, while stirring of 150 rpm. The insoluble part of cellulose was isolated by centrifugation, washed with water up to neutral pH, rinsed with ethanol, dried at 350 K to constant weight and weighed in order to determine the solubility of cellulose in g/L. Alkaline and acidic mercerization: The structural changes of CIβ samples were investigated after treatment with 7-18% (0.035-0.10 molar parts) sodium hydroxide or 60-69% (0.30-0.39 molar parts) nitric acid at room temperature overnight using liquid/solid ratio 50. Then, the samples were separated from the liquid phase by centrifugation, washed with water, neutralized up to pH 7, again washed with water, rinsed with ethanol and dried at 350 K to constant weight. The CII content was determined by the X-ray method of inner standards . If ΔG°c > 0, it means that the conversion of A1 into A2 is impossible because A1 is more stable than A2. If ΔG°c < 0, it means that the conversion of A1 into A2 is possible because A2 is more stable than A1. The experimental data regarding ΔfG° (Table 2) and some others thermodynamic characteristics of various crystalline allomorphs of cellulose showed that the relative phase stability of the allomorphs at standard conditions decreases in the following order : CII > CIV ≥ CI > CIII. Table 2: Thermodynamic characteristics of crystalline allomorphs . However, these standard thermodynamic characteristics are valid for macro-crystals only or in the case, when the rod-like cellulose nanocrystallites of various allomorphs have the same lateral size (Lcr) and specific surface area (Ssp). If the conversion process is accompanied by the change of specific surface area ΔSsp, then an additional thermodynamic characteristic, namely Gibbs-Thomson free surface energy (ΔG°s) should be taken into consideration . where Lcr,1 and Lcr,2 is lateral size of initial and final nanocrystallites, respectively; σ1,2 is interface energy; V = 10-4 (m3/mole) is molar volume of crystallites. It should be noted that the condition (7) is a necessary, but insufficient sometimes for implementation of a phase transition; and in some cases it requires an additional energy influx from various sources such as a heating, enthalpy of interaction with reagents, etc. Phase transitions of nanocrystallites upon thermal treatment in various medium: Widespread case of change of crystalline phase state is enlargement of nanocrystallites. For example, when cellulose sample is treated with dilute acid at elevated temperature, splitting of amorphous domains is carried out, resulting in the release of free nanocrystallites. Possessing an increased area of specific surface (Ssp), the free nanocrystallites have a thermodynamically instable state due to high free surface energy G°s = σVSsp. In order to reach the stable state, the area of specific surface should decrease (ΔSsp < 0), i.e. the following condition must be implemented : ΔG°s = σVΔSsp < 0. It means that small nanocrystallites should form more large crystallites. Really, after hydrolysis of cellulose in boiling acid, the enlargement of nanocrystallites is observed as a result of lateral co-crystallization process . This method for obtaining of large crystalline aggregates is used in technology of microcrystalline cellulose . Evident co-crystallization process occurs also after hydrothermal treatment of cellulose sample in the presence of small amount (1%) of sulfuric acid, when the lateral size of crystallites increases to 70% (Figure 1). Figure 1: Increase of lateral size of crystallites of SP after hydrothermal treatment at various temperatures. Know case of the phase transition is a recrystallization of CIII allomorph after treatment in boiling water, when nanocrystallites of CIII with lateral size of Lcr 3.3-3.4 nm are transformed into more large nanocrystallites of CI having Lcr of 5.0-5.1 nm (Figure 2, Table 1). As is known, to form the CIII allomorph, molecules of ammonia penetrate between (1-10) layers of crystalline lattice of CI and create crystalline complex consisting of swollen crystallites and introduced ammonia . As a result, the interplanar distance d(1-10) of the crystalline unit cell increases from 0.60 to 1.06 nm, and volume of the cell increases from 0.660 to 0.801 nm3. After ammonia evaporation from the crystalline complex its crystalline unit cell turns into unit cell of CIII1 having d(1-10) = 0.74 nm and volume of 0.698 nm3. Mechanism of the inverse transformation of CIII into CI after boiling in water, probably, consists in transition of amorphous nanodomains (AND) of CIII into viscoelastic state at heating in the plasticizing water medium; crystallization of viscoelastic AND on residual CI-nuclei with growth of large and stable CI nanocrystallites, which is accompanied by breaking of small unstable nanocrystallites of CIII. Transformation of CIII into CI allomorph is thermodynamically advantageous, since this phase transition leads to decrease of free energy of conversion, ΔG°c = - 6.4 (kJ/mole), calculated by eq. (4) using the data of Table 2, i.e. Figure 2: X-ray diffractograms of CIII (1) and this sample treated in boiling water (2). Total free energy of transition calculated by eq. (7): ΔG°t ≈ -19 (kJ/mole) << 0, which is favorably for conversion of small nanocrystallites of CIII1 into more large nanocrystallites of CI. On the other hand, when CIII allomorph contains more large crystallites than CI allomorph, the order of relative phase stability can be reversed. If Lcr of CIII is 7.0 nm and Lcr of CI is 5.0 nm, then the change of free surface energy will be: ΔG°s ≈ 6.8 (kJ/mole). Moreover, the total free energy of transition ΔG°t ≈ 0.4 (kJ/mole) > 0; thus in this case, the conversion of CIII1 into CI is thermodynamically unfavorable. Really, the experiments showed that large crystallites of high-crystalline CIII allomorph prepared by a method of super-critical ammonia treatment [18,28] it not converted into crystallites of CI allomorph after boiling in water . Another example of phase transition of nanocrystallites under thermal treatment is conversion of CI, CII and CIII into CIV after treatment in hot glycerol at 553 K. Study of this transition has shown that the main structural factor responsible for the formation of CIV allomorph is a lateral size of nanocrystallites. As can be seen from Table 3, the conversion of any allomorph into CIV structure is possible, when the lateral size of nanocrystallites Lcr ≤ 4.0 nm; whereas the larger crystallites cannot be transformed into the CIV allomorph. Thermodynamic calculations (Table 4) confirm the obtained experimental results. *Note: If the CIV index is zero it means the absence of phase transformation; If CIV index is one, it means complete transformation into CIV. Table 3. Structural characteristics of cellulose samples and their ability to conversion into CIV*. Table 4. Thermodynamics of CIV formation. Consider for example the transformation of nanocrystallites of KP, AC-1, KPM, KPA and RC into crystallites of CIV having Lcr = 5.8 nm. The calculations showed that samples of CI (KP) and CII (KPM) having large crystallites (6.8 and 5.5 nm) cannot be transformed into CIV, since ΔG°t > 0. However, other samples of CI (AC-1) and CII (RC) having small nanocrystallites (3.6 and 4.0 nm) can be transformed into CIV, since ΔG°t < 0. Low-crystalline sample of CIII (Lcr1 =3.3 nm) also converted into CIV. This fact elucidates, why large crystallites of natural cellulose samples (cotton cellulose, wood pulp, etc.) having CI allomorph do not transform directly into CIV after treatment in hot glycerol at 553 K [18,29]. Nevertheless, after partial decrystallization of natural cellulose samples, the remained small nanocrystallites of CI are easily converted into CIV allomorph at the conventional treatment conditions in hot glycerol (Table 3, Figure 3). Figure 3: X-ray diffractograms AC- I (1) and this cellulose treated in hot glycerol (2). where Tm,o is equilibrium melting point of macrocrystals; σ1,2 is interface energy; V is molar volume of crystallites; Hm is melting enthalpy. Calculations performed by means of eq. (8) showed that the equilibrium melting point reduces and reaches 533 K, i.e. processing temperature in hot glycerol, for nanocrystallites with lateral size of 4.3 nm (Figure 4). 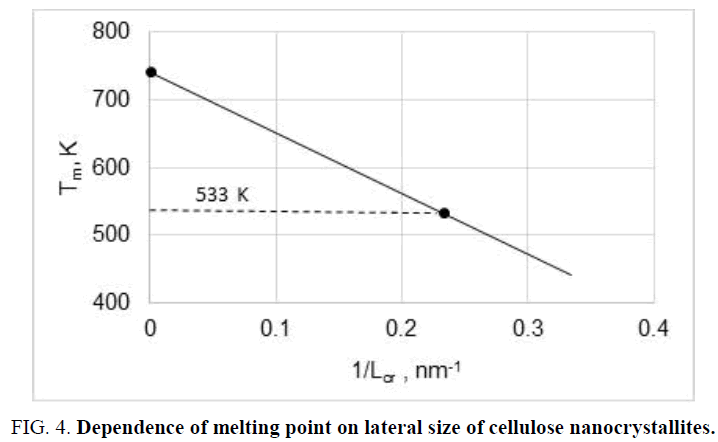 Figure 4: Dependence of melting point on lateral size of cellulose nanocrystallites. Thus, it can be concluded that the mechanism of CIV formation consist in reducing of the melting point of small nanocrystallites up to processing temperature (533 K) in plasticizing glycerol medium and amorphization of crystallites; transition of plasticized amorphized cellulose in viscoelastic state; and finally – the crystallization of viscoelastic amorphized cellulose into relative large crystallites of CIV having Tm > 533 K.
Effect of nanocrystallites on solubility: Study of dissolution of cellulose samples having close DP values in some solvents such as Cuproxam (CX) and 82% H3PO4 (PA), revealed that solubility of cellulose (SC) increases with decrease in lateral size of nanocrystallites (Table 5). where σc-s is crystallite - solvent interface energy; V is molar volume of crystallites. The known explanation for this relationship is that small nanocrystallites with size Lcr have an increased area of surface energy, which shifts the equilibrium in the system: crystallite – its saturated solution, towards a higher concentration of solute in the solution. According to equation (9), logarithm of solubility should be inversely proportional to lateral size of nanocrystallites, which is confirmed with experimental dependences obtained for nanocrystallites of cellulose (Figure 5). 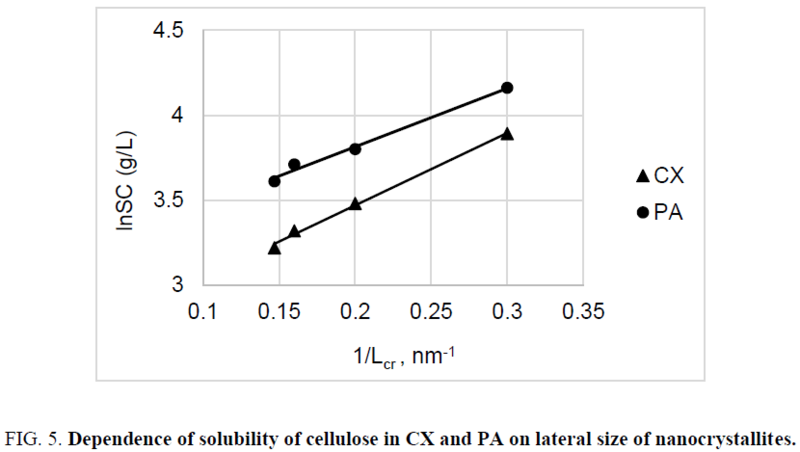 Figure 5: Dependence of solubility of cellulose in CX and PA on lateral size of nanocrystallites. As is known, mercerization is a physicochemical process in which CI allomorph of natural cellulose is transformed into CII allomorphs of mercerized cellulose. Usually mercerization is carried out by cellulose treatment with alkaline solutions of NaOH . Nevertheless, sufficiently concentrated solutions of nitric acid also cause conversion of CI into CII . Mechanism of irreversible transformation of CI into CII during mercerization consists in penetration of hydroxyl anions or molecules of nitric acid between (1-10) layers of crystalline lattice of CI with creation of crystalline complex consisting of swollen crystallites and introduced agents, which turns into hydrated crystallites after washing and then into CII crystallites after drying [33,34]. Study of mercerization process showed that phase transition of CI into CII for small nanocrystallites occurs at lower concentration of mercerizing agent than for large crystallites [32-35]. This phenomenon can be explained by means of chemical thermodynamics. where Cc in molar concentration of mercerizing agent in crystalline phase. where Cs is concentration of the mercerizing agent in solutions that cause the complete transformation of CI into CII for nanocrystallites; Lcr is lateral size of nanocrystallite; V is molar volume; σc-s is interface crystallite-solution energy. Thus, equation (15) predicts that with decreasing in lateral size of nanocrystallites CI, the transformation of CI into CII will be performed at lower concentration of the mercerizing agent (NaOH or HNO3), which is confirmed by experimental results (Figure 6 and Figure 7). 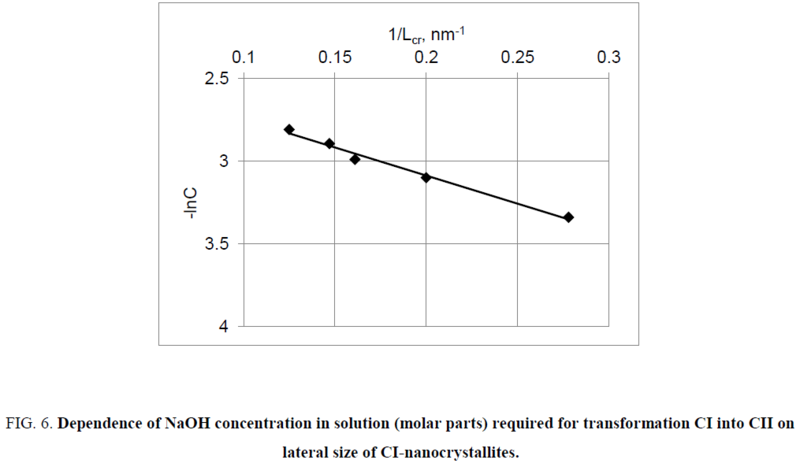 Figure 6: Dependence of NaOH concentration in solution (molar parts) required for transformation CI into CII on lateral size of CI-nanocrystallites. Figure 7: Dependence of HNO3concentration in solution (molar parts) required for transformation CI into CII on lateral size of CI-nanocrystallites. Various crystalline allomorphs of cellulose CI, CII, CIII and CIV can change the phase state as a result of phase transitions, such as decrystallization, crystallization, recrystallization, co-crystallization, transformation of one into another allomorph, etc. However, in contrast to macro-crystallites, phase state and transitions of nanocrystallites cannot be described by laws of classic thermodynamics, since in this case a special thermodynamics of nano-scale phases with the consideration of free surface energy should be applied. In this paper it was found that phase state and conditions of phase transitions of rod-like nanocrystallites are depended on their lateral size (Lcr), which directly affects the area of specific surface of nanocrystallites. Small nanocrystallites have instable phase state; as a result they have tendency to co-crystallization with forming of larger crystallites having a low area of specific surface. After treatment in boiling water small nanocrystallites of CIII easily recrystallize into crystallites of CI, whereas for CIII having large crystallites this phase transition cannot be implemented. It is also found that after heating in glycerol at 533 K small nanocrystallites (Lcr ≤ 4.3 nm) of three allomorphs, CI, CII and CIII, can be transformed into large crystallites of CIV, whereas the larger crystallites of these allomorphs cannot be converted directly into CIV. Furthermore, small nanocrystallites of CI are more soluble, and their transformation into CII occurs at lower concentrations of mercerizing agents. To estimate stability of phase state of nanocrystallites and forecast the direction of the phase transition, the total free energy of transition should be used with the consideration of surface free energy of Gibbs-Thomson. Krässig H. Cellulose: Structure, Accessibility and Reactivity. Gordon and Breach Publ. Amsterdam, 1993. Zugenmaier P. Crystalline Cellulose and Cellulose Derivatives: Characterization and Structures. Springer- Verlag, Berlin/Heidelberg, 2008. Ioelovich M. Cellulose Nanostructured Natural Polymer. LAP, Saarbrücken, 2014. Ioelovich M, Leykin A. Formation of nanostructure of microcrystalline cellulose. Cell. Chem. Technol.2006;40: 313-7. Sugiyama J, Vuong R, Chanzy H. Electron diffraction study on the two crystalline phases occurring in native cellulose from an algal cell wall. Macromolecules.1991;24: 4168-75. Zugenmaier P. Conformation and packing of various crystalline cellulose fibers. Progress Polym. Sci. 2001;26: 341-1417 . Langan P, Nishiyama Y, Chanzy H. X-ray structure of mercerized cellulose II at 1 a resolution. Biomacromolecules. 2001;2(2):410-6. Ioelovich MY, Kaimin IF, Veveris GP. The crystallization of amorphized cellulose. J. Polym. Sci.1982;24: 1382-87. Caulfield DF, Steffes RA. Water-induced recrystallization of cellulose. TAPPI. 1969;52: 1361-6. Nordin S, Nyren J, Back E. Note on molten cellulose produced in a laser beam. Svensk Papperstidn. 1973;76(16): 609-10. Ioelovich M. Study of thermodynamic stability of various allomorphs of cellulose. J. Basic Appl Res Int. 2016;16(2): 96-103. Ioelovich M. Thermochemistry of cellulose dissolution process. Wood Chem. 1985;5: 111-12. Ioelovich MY, Cemeris NA, Cemeris MM. Effect of cellulose modifying on enthalpy of formation. Wood Chem. 1988;4: 15-8. Goldberg RN, Schliesser J, Mittal A, et al. A thermodynamic investigation of the cellulose allomorphs: Cellulose(am), cellulose I? (cr), cellulose II(cr), and cellulose III(cr). J. Chem. Thermodyn. 2015;81: 184-26. Dumitriu S. Polysaccharides: Structural Diversity and Functional Versatility. Marcel Dekker, New York, 2004. Brown R.M, Saxena IM. Cellulose: Molecular and Structural Biology. Springer, Dordrecht, 2007. Wada M, Heux L, Sugiyama J. Polymorphism of cellulose I family: reinvestigation of cellulose IVI. Biomacromolecules. 2004;5(4):1385-91. Yatsu LY, Calamari TA, Benerito RR. Conversion of cellulose I to stable cellulose III. Textile Res J.1986;56(7): 419-24. NREL CAT Task LAP 002; Two Stages Sulfuric Acid Hydrolysis for Determination of Carbohydrates. Ioelovich M, Leykin A; Nano-cellulose and its application. SITA. 2004;6: 17-24. Ioelovich M, Leykin A, Figovsky O. Study of cellulose paracrystallinity. Bioresources. 2010;5(3): 1393-407. Ioelovich M, Veveris G. Determination of CII crystalline modification by X-ray method of the inner standard. Wood Chem. 1983;2: 10-14. Kaptay G. The Gibbs equation versus the Kelvin and the Gibbs-Thomson equations to describe nucleation and equilibrium of nano-materials. J Nanosci Nanotechnol. 2012;12(3):2625-33. Ioelovich M. Cellulose as a nanostructured polymer: a short review. Bioresources. 2008;3(4): 1403-18. Battista OA, Smith PA. Microcrystalline cellulose. Ind. Eng. Chem. 1962;54(9): 20-9. Goichman AS, Solomko VP. High-molecular Inclusion Compounds. Science, Kiev, 1982. Mittal A, Katahira R, Himmel ME, et al. Effects of alkaline or liquid-ammonia treatment on crystalline cellulose: changes in crystalline structure and effects on enzymatic digestibility. Biotechnol. Biofuels. 2011;4: 41-50. Kulshreshth K. A review of the literature on the formation of cellulose IV, its structure, and its significance in the technology of rayon manufacture. J. Text. Inst. 1979;70(1): 13-8. Ioelovich M, Luksa R. Alteration of crystalline structure of cellulose during thermal treatment. Wood Chem. 1990;3: 18-20. Perez M. Gibbs–Thomson effects in phase transformations. Scripta Materialia. 2005;52: 709-12. Warwicker JO, Jeffries R, Colbran RL, et al. A review of the literature on the effect of caustic soda and other swelling agents on the fine structure of cotton. Shirley Inst. Pamphlet. 1966;93: 1-247. Gert EV, Socarras Morales A, Zubets OV, et al. The features of nitric acid ‘mercerization’ of cellulose. Cellulose. 2000;7: 57-66. Ioelovich M. Crystalline structure of alkali-celluloses and its influence on viscose forming process. Wood Chem. 1990;2: 8-15. Ioelovich M. Effect of alkaline solutions on crystalline structure of modified celuloses. Wood Chem. 1986;3: 7-11. Nishimura H, Sarco A. Mercerization of cellulose: mechanism of mercerization and crystalline sizes. J. Appl. Polym. Sci. 1987;33(3): 867-74.